Do you need a bridal shower party kit? Are you hosting a bridal shower? 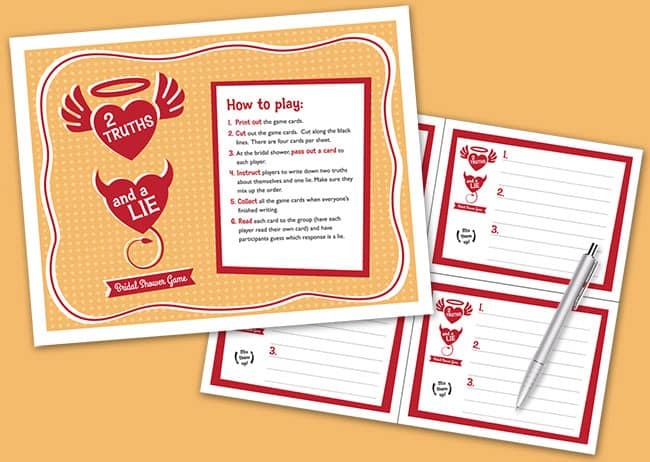 And, are you looking for a fun way to entertain guests at the event? We have a complete solution for you! 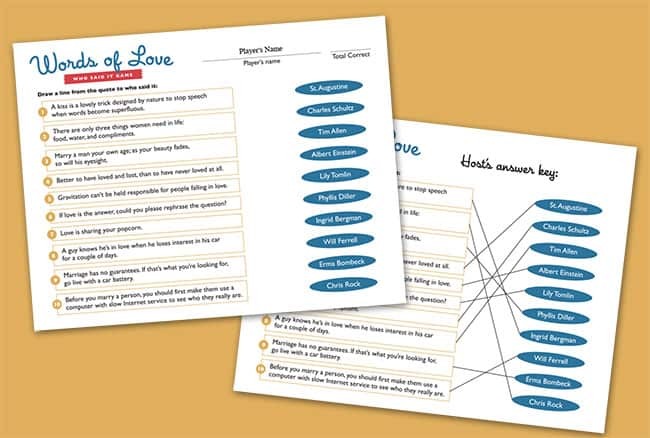 Our Bridal Shower Party Kit features 7 fun games, 3 “host helper” forms – a gift record with a spot to capture mailing addresses, an invite email reminder, and a party agenda – and a “My Advice for a Happily Married Life” keepsake for the bride. With this Bridal Shower kit, you’ll be ready to host a fun event that guests and the bride will long remember! All of these elements arrive to you within minutes after purchase via a download link. From the link, you’ll download a zip file, and from there access the PDFs for each item. The PDFs work on Macs and PCs. • How Well Do You Know This Couple? 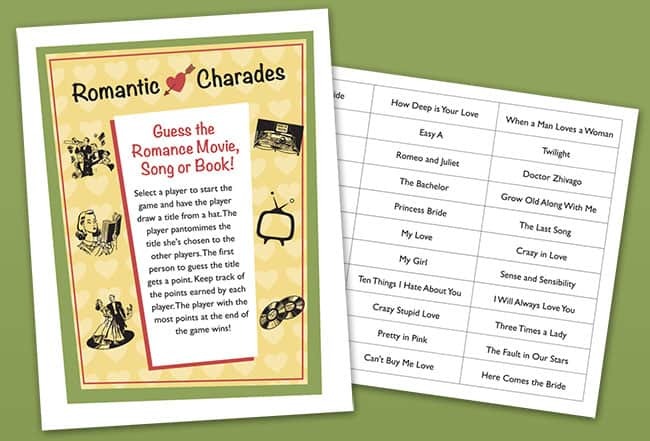 For many of the bridal party kit components, we provide you with the opportunity to personalize the games and other items. With some of the activities, we also give you the chance to fill in the items prior to the event. There are options to type in the text fields or hand write your responses. We’ve also included duplicate pages within the pdf files where needed. 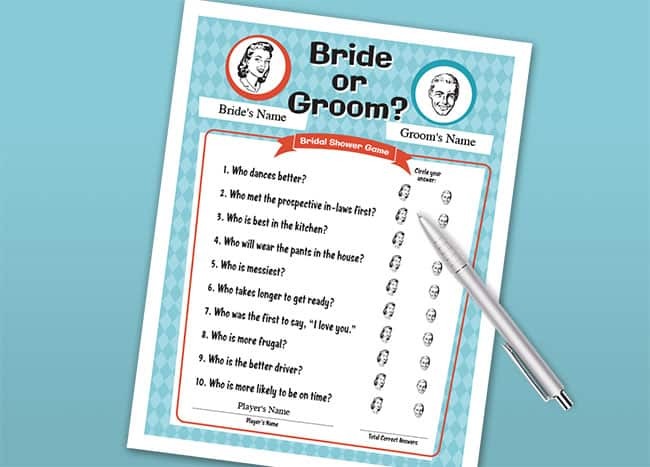 The host can send the Bridal Shower Game – Bride or Groom – to the groom prior to the event so the guests can see how he answers in comparison to the bride and party attendees. You can type or write in the agenda on the Order of Festivities document. The host can send out the Bride’s Keepsake – My Advice for Happy Marriage – prior to the event to the guests. Guests can type in their responses or hand write them. And if you’re looking for messages to convey to the new bride and groom, check out our suggestions for wedding card messages. There are seven to choose from. Some hosts will choose to play a couple while others may play them all. It’s your call. The classic favorite is always good for some laughs. Guests attempt to match romantic quotes to the authors. 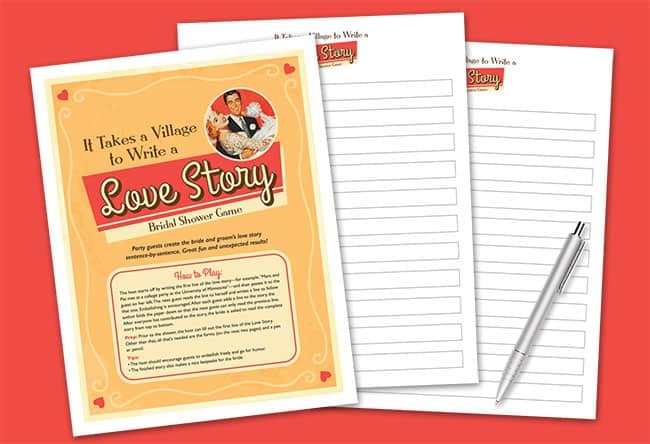 Guests each write a line to a love story in sequence. Embellishing and humor are encouraged. 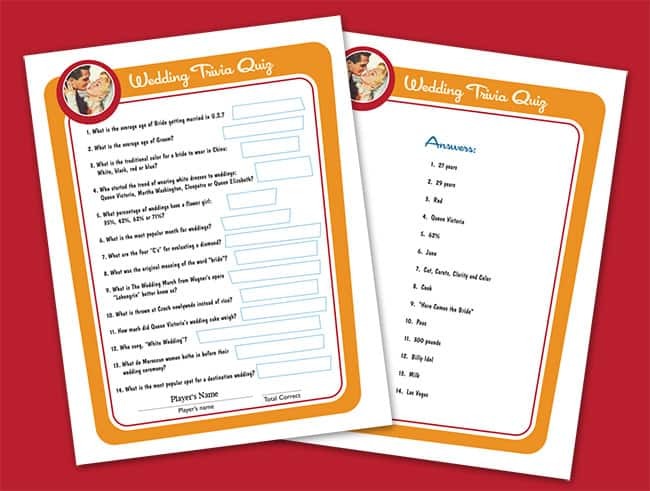 Guests show how much they know about weddings in this fun Q & A. So, you think you know this couple well? Let’s find out. A keepsake for the bride – advice on a happy married life. Plus, a gift record, order of festivities for the day, and an invite reminder. Just download the .zip file and open each of the PDFs. 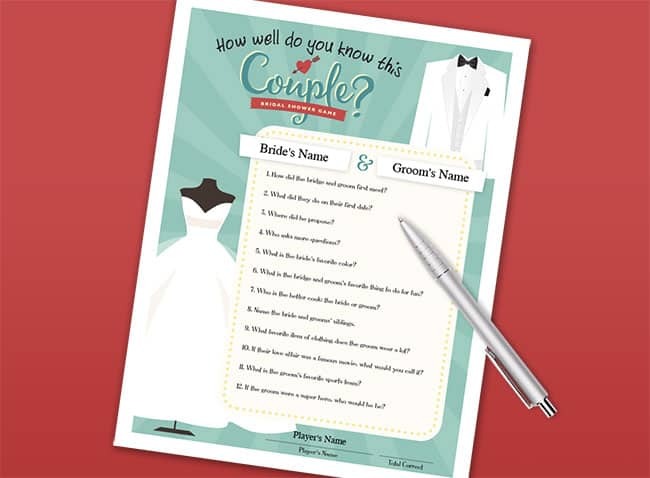 Some PDFs will have form fields where you can add the bride’s/groom’s name, etc. In some cases the forms will have a duplicate page without fields if you want to print them out blank. 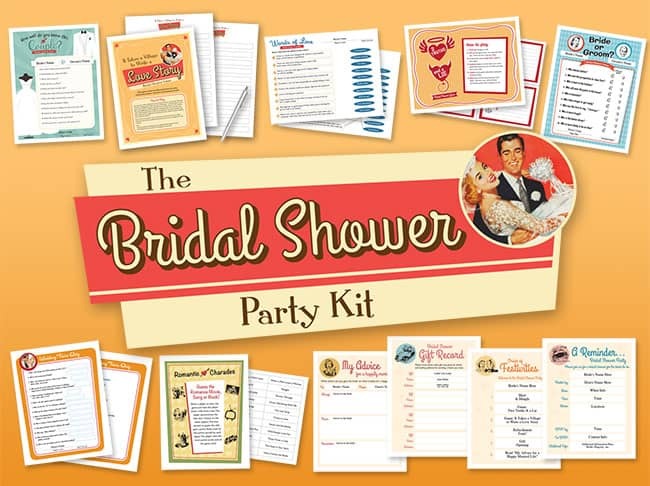 This kit will provide you with everything you need for a lively and entertaining bridal shower party. Download it today and have a great party!